2015 CABERNET FRANC RECEIVES SILVER AT THIS YEAR'S CIWF. We entered 16 wines and received 16 medals. On Tuesday, April 12th, Joe Henke of Henke Winery was invited to the floor of the house of representatives. There on the floor, representative Denise Driehaus presented her first recognition award to Joe Henke & Henke Winery for winemaking excellence. Bronze for Merlot and Chardonnay. Ten esteemed judges tasted and evaluated 236 entries from wineries all over Ohio. (made entirely from locally grown grapes). 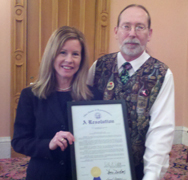 Wednesday, March 24th on the State House Floor, Ohio State Representative Denise Driehaus (District 31) and Speaker of the House Armond Budish presented Henke Winery an award for winemaking excellence and service to the community, committed to maintaining the highest industry standards. Please visit us on Facebook for more information and pictures from this event. Thanks for helping us make this possible. Henke Winery received two gold medal at the Finger Lakes International Competition. The wines are Vendange A Trois and Cabernet Sauvignon. We entered 10 wines into the Ohio Wine Competition and won 10 awards. Again Henke Winery can boast of having won the "Best of Show" for our 2008 Riesling. We entered 3 wines and received 3 medals- all double gold! We entered 6 wines and received 6 medals! 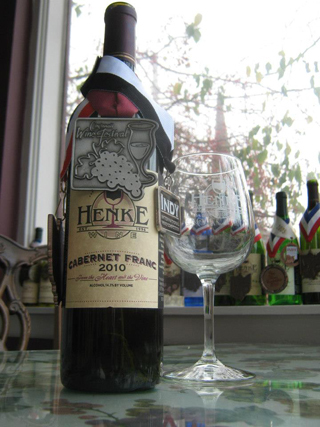 Held in Riverside County, California, Henke Wine received two medals. Henke Winery was invited to the State House for the 2008 Ohio Quality Wines Program where Joe and Joan poured three wines, Vidal, Vin de Rouge and Norton. We are proud to announce the Norton won the Director's Choice Award for The Best Red Wine in the State for the second year in a row. Stop in to taste this award winning wine.